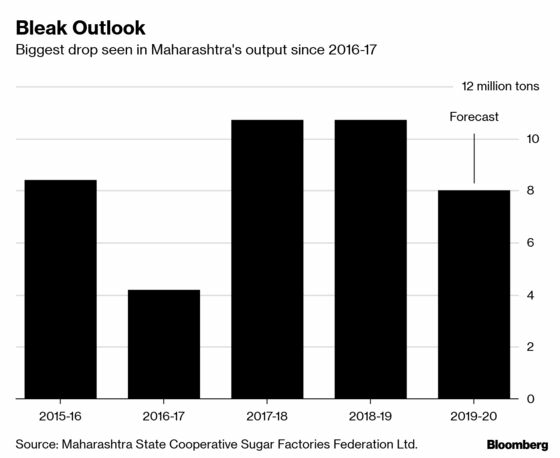 (Bloomberg) -- Sugar output in the western Indian state of Maharashtra may tumble to a three-year low as dry weather cuts plantings. Production for the year starting Oct. 1 may be 8 million tons, down at least 25 percent from this year’s output, said Sanjay Khatal, managing director of the Maharashtra State Co-operative Sugar Factories Federation Ltd. That would be the least since 2016-17, when production almost halved. Production this year is likely to exceed 10.7 million tons, he said. The forecast comes as private Indian forecaster Skymet Weather Services Pvt. predicts a drier-than-normal monsoon this year. That may offer relief for other producers such as Australia and Brazil, which have complained to the World Trade Organization that India’s gushing exports and subsidies are suppressing global prices. Sugar futures, which have gained about 7 percent this year after dropping almost 40 percent in the previous two years, may find further support. Prolonged dry weather in the state is affecting sugar cane planting, Khatal said. “Some farmers may shift to short-duration crops such as pulses,” he said. The area under sugar cane, which will be harvested from October, may drop by 25 percent to 30 percent from a year earlier due to poor weather conditions, Khatal said, without providing details. An estimated 75 million tons of cane will likely be crushed in 2019-20, compared with about 100 million tons this year, he said. India’s June-September monsoon, which delivers more than 70 percent of the country’s annual rainfall, is likely to be below normal this year as the El Nino weather pattern may impact rain, according to Skymet. Precipitation during the rainy season is forecast to be 93 percent of the long-term average of about 89 centimeters. Sugar production in Maharashtra during the current year totaled 10.62 million tons as of Monday, up from 10.3 million tons a year earlier, Khatal said. Mills crushed 94.5 million tons of cane as of April 8, compared with 92.1 million tons a year earlier, he said. India’s total sugar production, which reached a record 32.5 million tons in 2017-18, may drop to 31.5 million tonnes in the current year, and to 30 million tons in the year starting Oct. 1 on dry weather and as more cane may be diverted to boost ethanol output, according to the National Federation of Cooperative Sugar Factories Ltd. Output could fall to 27-28 million tons in 2020-21, according to the federation.